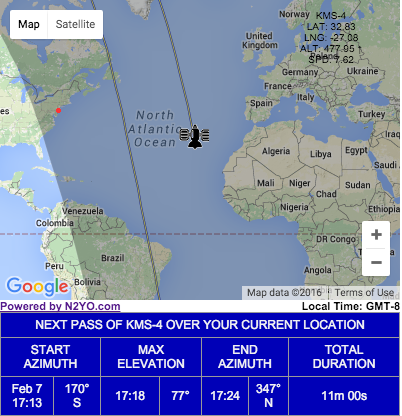 North Korea’s Kwangmyongsong-4 satellite is up in space and orbiting the globe. The country’s media said the launch took place a 0030 UTC on Sunday — something that matched with detection of the launch at around 0031 UTC. The rocket appeared to keep largely to its intended path so the likelihood of success was good and U.S. Strategic Command picked up an object from the launch. The data from Strategic Command allowed me to come up with the graphic above. 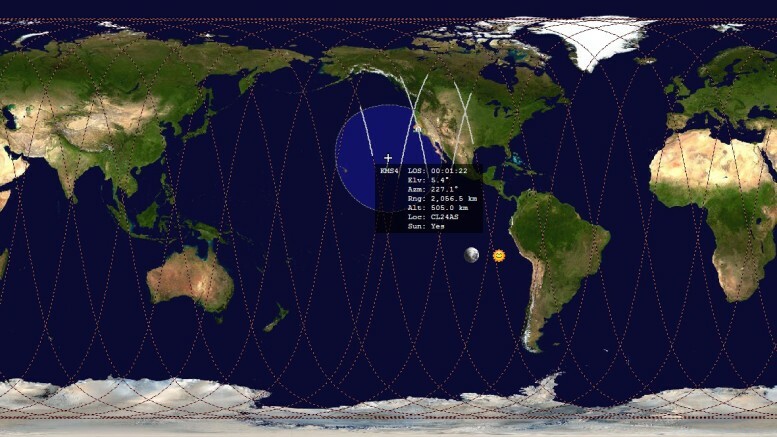 It shows the orbit of what is presumed to be the Kwangmyongsong-4 satellite — the five white parts of the path show it should be within range of San Francisco five times in the 24 hours from when the plot was made. If you want to track it yourself, the N2YO website has it added. The data is important because it enables amateur satellite trackers to attempt to see and hear the satellite. It was a visual image that confirmed Kwangmyongsong 3-2, the first satellite successfully launched by North Korea, was tumbling on its path and likely useless. That helped to explain why no radio transmissions were being heard. This time, a similar hunt is on but there’s an extra hurdle. North Korea hasn’t published any technical details about the satellite’s transmissions. A starting point is the 470MHz frequency said to be used by Kwangmyongsong 3-2, but even that was an approximate one. So far, there have been no reports of transmissions from the satellite. We also don’t know what we’re listening for. In the past, North Korea claimed its satellites were broadcasting the Song of Kim Il Sung and Song of Kim Jong and morse code. This time we’re not sure. The only stated mission is earth observation. And one interesting note from the orbit data. Kwangmyongsong 4 is scheduled to pass almost directly over Levi’s Stadium at 8:30pm local time on Sunday. That will likely be shortly after the end of Super Bowl 50, although it’s almost certainly a coincidence.